EOO is 11275 km², known from between 10-11 locations. 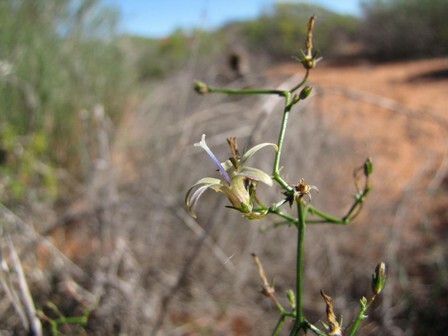 This sandveld endemic is threatened by habitat loss due to mining of heavy mineral sands along the West Coast and potential mining expansion in the future. It is further threatened by habitat loss due to expansion of crop cultivation (wheat). Sandveld in acid-alkaline sand ecotones. Threatened by past and present mining of heavy mineral sands along the West Coast and potential expansion in the future. Further it is threatened by agricultural activities of crop cultivation. Adamson, R.S. 1955. 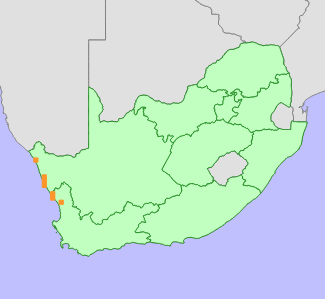 The South African species of Lightfootia. Journal of South African Botany 21:156-211.